Harriet Tubman (Howland's handwritten id on the skirt), circa 1860s. Library of Congress: hdl.loc.gov/loc.pnp/ppmsca.54230. In early 2017, I wrote a blog post about a newly discovered photo of Harriet Tubman. It shows an angular and dedicated woman--actually, rather "feminine" and delicately dressed--far different than the other known images of her. When I wrote that initial post, the photograph was in an auction. I gave a small amount of money to one of the bidders, the Harriet Tubman House in Auburn, NY. I did not know yet know who purchased it, and whether it might even go to a private collector. Happily, although they were not successful, the Smithsonian and Library of Congress purchased the album in April 2017. They paid $161,000, according to news reports. The photograph was ensconced in the middle of an album owned by abolitionist Emily Howland. A common custom of the day was to collect photographs and/or autographs of friends and famous people. The album, true to form, contained a mix of subjects. It is likely that she and Harriet Tubman had at least crossed paths through their anti-slavery circles. After conservation and digitizing, the album became available last month to view (and download) online. 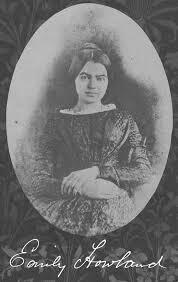 As for Emily Howland, she spent time as a teacher and relief worker in Washington during the Civil War. (She also was in Washington teaching at a school for young black women in the 1850s.) She and Julia Wilbur knew each other--a few letters from Julia to her survive. After the war, she moved further south--her father purchased land on Virginia's Northern Neck where she attempted to set up a viable community for formerly enslaved people. She moved back to New York in the early 1880s but remained active in her causes. She was over 100 years old when she died. People from there have told me that she was the legendary "Miss Emily." For the life of Emily Howland: The World of Emily Howland: Odyssey of a Humanitarian by Judith Colucci Breautl.